An absolute reference in Excel refers to a reference that is "locked" so that rows and columns won't change when copied. 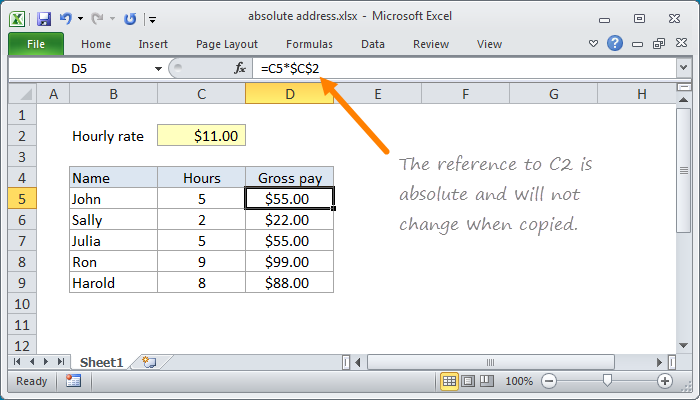 Unlike a relative reference, an absolute reference refers to an actual fixed location on a worksheet. Note that the absolute reference to C2, which hold the hourly rate does not change, while the reference to hours in C5 changes with each new row. When entering formulas, you can use a keyboard shortcut to toggle through relative and absolute reference options, without typing dollar signs ($) manually.